With a little more than $67,000 to appropriate, the Student Government Association heard funding requests from all 22 groups that applied for funding, but denied four groups their requests. The $100,000 IT Grant is given to SGA every fall to appropriate to student groups and college departments. This differs from the RSO appropriations done every semester in that money given through the IT Grant can only go toward technology services. Out of the starting $100,000 SGA has already allocated $27,500 for the implementation of the LiveSafe safety app and $5,000 for OrgSync, to bring the total of available money to $67,500. EKU Opera was denied its requested money. The group requested money for equipment needed to redo lighting and other needed improvements for the EKU Center for the Arts. Jean Marlow, deputy chief technology officer, said the request could be an issue. “EKU Center for the Arts using student technology money to purchase equipment to be permanently installed there is not an appropriate use of your technology money,” Marlow advised the SGA members. Academic Affairs Chair Andrew Hainley said he spoke with the appraiser for the group and was assured the funding would not be permanently attached to the EKU Center for the Arts, but would belong to the Opera Guild. SGA members were concerned with the permanency of the equipment, but Hainley explained the importance for students in the program to be able to perform. “Opera Guild is the primary way that performance majors get the resume building things that get them jobs,” Hainley said. After the time for open discussion, SGA members had a mixed vote of nine in favor, eleven against and seven abstained. Hainley would again ask for reconsideration on this decision at the end of appropriations, but SGA President Katie Scott said the decision could not be revisited because it was voted on. The upcoming Student Success Center, to be completed in January, received funding for some aspects needed in the facility. The Center, located on the first floor of the library in an old microfilm room, will provide a number of services to students from academics to financial aid and will be a one stop shop for students who need help, said Matt Schumacher, director of retention programs. Marlow said of the ten computers requested, one could be provided by the university for staff use and she recommended the other nine be requested through a different funding program. 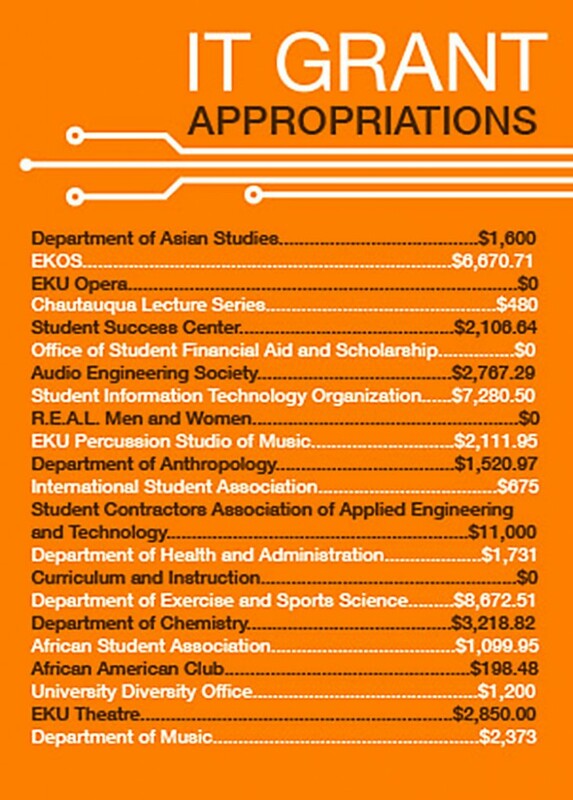 After ending discussion, SGA voted and granted the Student Success Center $2,106.64. The Student Contractors Association of Applied Engineering and Technology was a group that was granted one of the highest amounts with $11,000. The group requested a robotic tool station for $11,000 to help students gain skills needed for a career after college. Other requested items, such as hats, vests and safety glasses, could not be funded by the IT grant. 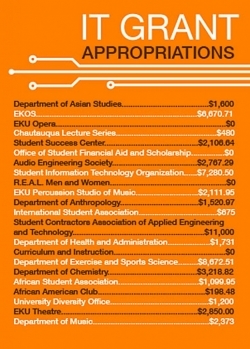 When appropriations concluded, SGA had $9,943.18 remaining in the budget.